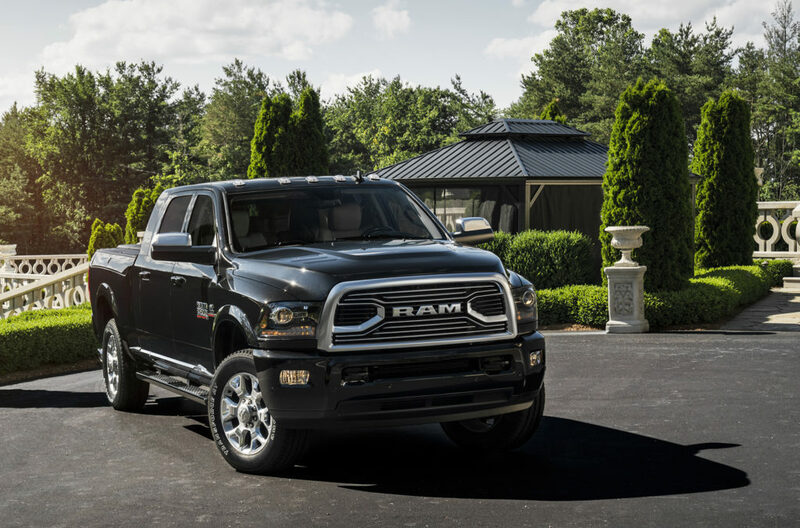 As it nears the end of its lifespan, the current generation heavy-duty Ram pickup remains remarkable for a long list of reasons. For me, its comfortable, quiet ride is at the top of that list. People who buy a hard-working truck like this have a job in mind, though, and the Ram HD offers some head-turning numbers to help them do it. The Ram 3500 can tow up to 31,210 pounds, while the Ram 2500 I tested can tow nearly 18,000 pounds — a number that’s hard to wrap my head around as someone who normally sits at a desk and works in media. Unsurprisingly, it takes insane amounts of power to do the kind of non-desk work for which this truck is designed. With a monstrous, 6.7-liter Cummins diesel engine packed under the hood, it makes up to 900 pound-feet of torque. The 6.4-liter gasoline V8 in my tester was a bit more sensible with 410 horsepower and 429 pound-feet of torque on tap. Ram adds a new, higher trim level to its heavy-duty truck lineup for 2018. The Limited Tungsten, shown here, has a suede headliner, chrome grill and long list of luxury upgrades. Still, it’s not the capability that blows me away from behind the wheel. It’s the comfort. Even in the face of new competition — especially the brilliantly redesigned Ford Super Duty line — this big Ram remains the best riding truck on the market thanks to its genius-level suspension design. It’s the only truck in its segment that offers a five-link coil system or an air suspension, and it feels shockingly smooth for something seemingly designed to pull museums off their foundations. An all-new Ram HD is looming on the horizon, though, which raises some big questions — and a potential opportunity for bargain hunters. The half-ton Ram 1500 just underwent the most impressive redesign of any truck in the last decade, and its sales numbers are jumping to all-time records as a result. If the new HD’s upgrades are even half that good when it’s available in the next year or so, demand for the new design will be through the roof. Some one-ton and three-quarter-ton Ram drivers are surely waiting for the new generation that’s been spied testing on public roads this year. That means there will be pent-up demand for the new model and some potential deals to be had on the old one, which is still one of the best heavy-duty trucks on the market. Light tan leather with dark blue piping makes the Limited Tungsten’s seats stand out. Ram isn’t resting on its laurels, either. For 2018, they added an incredibly luxurious Limited Tungsten edition, upgraded the looks of the Sport models and offered a better infotainment system: an 8.4-inch screen with higher resolution, “pinch to zoom” like smartphones, and Android Auto and Apple CarPlay connectivity. They also added a convenient switch in the truck bed to activate the bed lights, made the backup camera standard equipment and rolled out a new telematics system to help fleet operators track their vehicles. The Tungsten version is nice even by the ever-climbing standards of luxury trucks. It has a suede headliner, exclusive light tan and blue leather, authentic wood trim, body-color exterior bits and a chrome grill and badging to give it some bling. 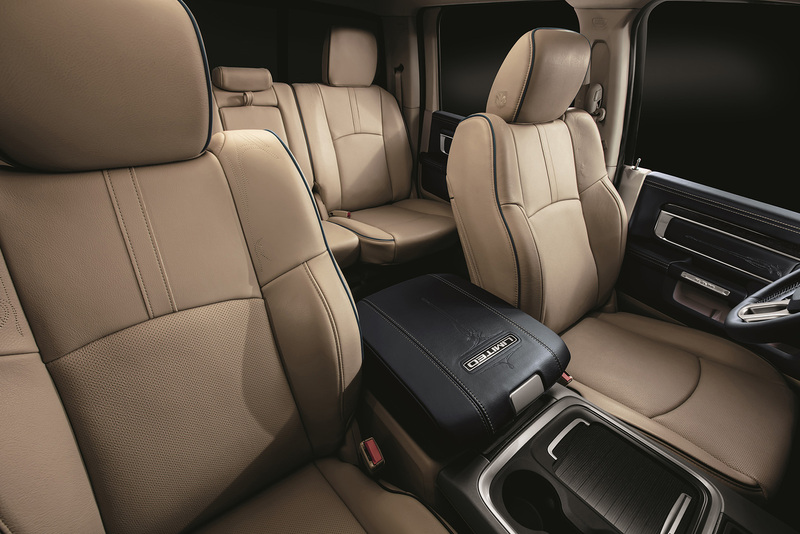 Pricing on the Ram 2500 starts at $33,045 for the Tradesman work truck and ranges to $58,645 for the Limited grade. The more capable Ram 3500 is priced from $34,445 to $59,545. It offers an incredibly smooth, quiet ride for something designed to do hard work. A new Limited Tungsten trim level raises the luxury bar.